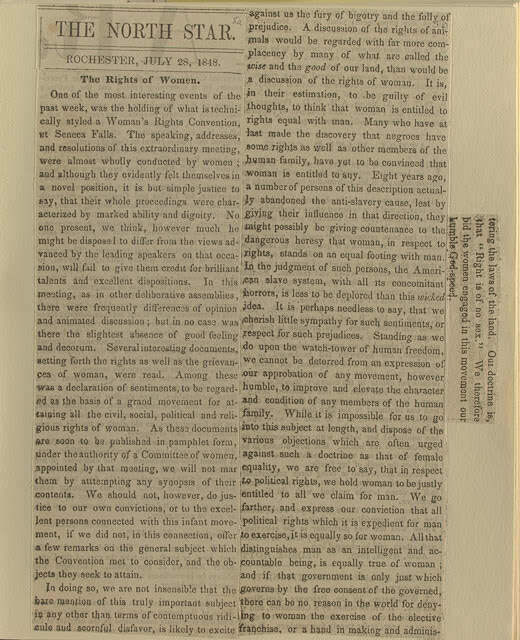 The formal quest for Women's Suffrage, in America, began when Elizabeth Cady Stanton and her colleagues drafted a "Declaration of Sentiments" and held a Women's Rights Convention in Seneca Falls, New York in July of 1848. This image depicts one of the quotes from the Declaration. On July 16, 1848, in another home owned by Richard Hunt (known as the M’Clintock House in the upstate New York village of Waterloo), Elizabeth Cady Stanton, with the help of her colleagues, drafted a "Declaration of Sentiments." 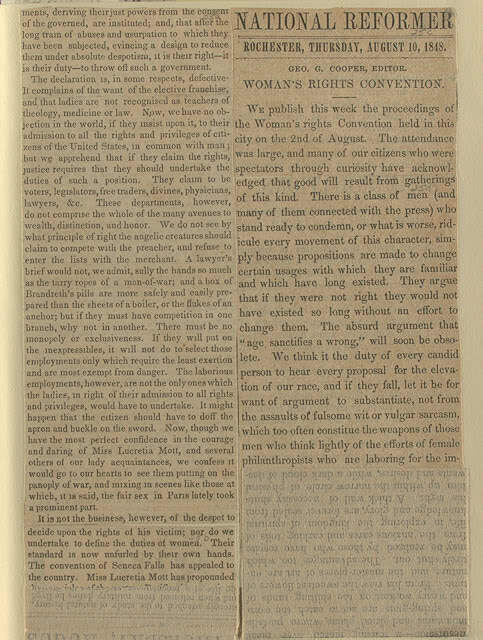 That document served as a rallying cry for the first Women’s Rights Convention which began three days later in the Wesleyan Chapel of Seneca Falls. Three hundred women and men, including the abolitionist Frederick Douglass, attended. We hold these truths to be self-evident; that all men and women are created equal; that they are endowed by their Creator with certain inalienable rights; that among these are life, liberty, and the pursuit of happiness; that to secure these rights governments are instituted, deriving their just powers from the consent of the governed. A discussion of the rights of animals would be regarded with far more complacency by many of what are called the wise and the good of our land, than would be a discussion of the rights of woman. It is, in their estimation, to be guilty of evil thoughts, to think that woman is entitled to rights equal with man. Many who have at last made the discovery that negroes have some rights as well as other members of the human family, have yet to be convinced that woman is entitled to any. The Oneida Whig (August 1, 1848): "Was there ever such a dreadful revolt? ... This bolt is the most shocking and unnatural incident ever recorded in the history of womanity. If our ladies will insist on voting and legislating, where, gentlemen, will be our dinners and our elbows? Where our domestic firesides and the holes in our stockings?" The Mechanic's Advocate, Female Department: "The women who attend these meetings, no doubt at the expense of their more appropriate duties, act as committees, write resolutions and addresses, hold much correspondence, make speeches, etc. etc. They affirm, as among their rights, that of unrestricted franchise, and assert that it is wrong to deprive them of the privilege to become legislators, lawyers, doctors, divines, etc. etc. ... Now it requires no argument to prove that this is all wrong." The National Reformer (August 31, 1848): Criticizing the Mechanic's Advocate article, the National Reformer notes: "O, shocking! Why, the world will be turned up-side down. The presumptious creatures 'hold much correspondence.' Laws should be passed by the 'lords of creation,' to prevent women, like other slaves, from learning to read, or they will soon prove themselves an over-match for their lords. . .Oh, oh! what will be done? If the 'lords of creation' cannot monopolize the 'learned professions,' then they are done for." 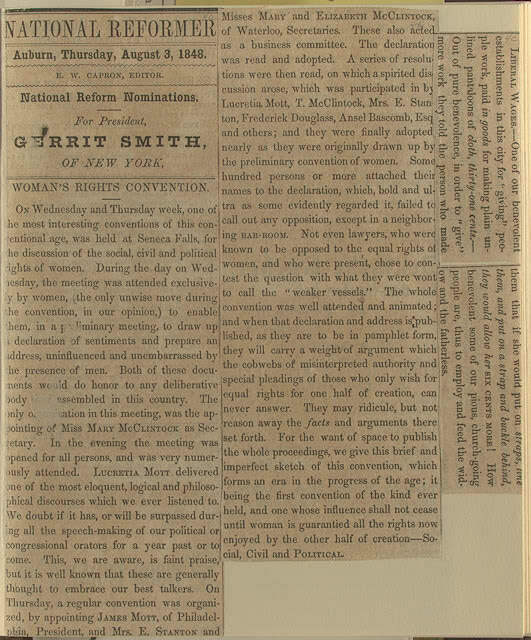 The National Reformer (August 10, 1848): "There is a class of men (and many of them connected with the press) who stand ready to condemn, or what is worse, ridicule every movement of this character, simply because propositions are made to change certain usages with which they are familiar and which have long existed. They argue that if they were not right they would not have existed so long without an effort to change them." But women, in increasing numbers, were growing weary of having too-few rights. Bos, Carole "DECLARATION OF SENTIMENTS" AwesomeStories.com. Jul 01, 2004. Apr 20, 2019.